From her cookbooks to her magazine to her daily talk show, Rachael Ray's message remains the same today as the day she wrote her very first 30-minute meal—making delicious, knock-your-socks-off dishes should be fun, fast, fulfilling, and foolproof. 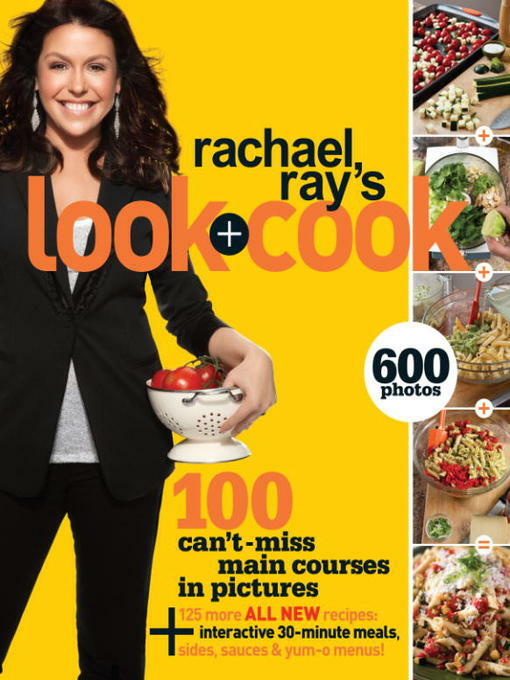 Rachael now presents her best idea yet: Rachael Ray's Look + Cook—100 brand-new recipes, each featuring beautiful and helpful step-by-step full-color photographs that illustrate how to create each meal, along with photographs of the gorgeous finished dishes. You literally look along while you cook! But that's not all . . . at the back of Rachael Ray's Look + Cook, you'll find 125 bonus, never-before-published recipes, including 30-Minute Meals; Yes! the Kids Will Eat It; Sides & Starters; Simple Sauces & Bottom-of-the-Jar Tips; and Desserts. As if that weren't cool enough, Rachael Ray's Look + Cook also features accompanying real-time video available online for select recipes at www.rachaelray.com. Rachael makes it easier than ever to prepare delicious home-cooked meals as you follow along with the step-by-step photographs or even the video! Having a last-minute dinner? No worries . . . you'll wow the crowd with Gazpacho Pasta, Fancy Pants Salmon, or Almost Tandoori Chicken. Looking for some fun twists on classic dishes that will have your kids clamoring for more? The Open-Face Turkey Burgers with Potpie Gravy and the Coconut Fish Fry are sure to be family faves! Wondering what to do with those last spoonfuls in the jars lining your refrigerator door? Check out Rachael's Bottom-of-the-Jar Sauces and add pizzazz to any meal with Salsa Dressing, Orange Bourbon Glaze, or Spicy Thai Peanut Sauce. Packed with the value that her fans love and have come to expect, Rachael Ray's Look + Cook has a simple-to-follow recipe to fit every occasion.